We don't subscribe to the view that comedy is comedy and drama is drama and never the twain shall meet. A deft tonal mix can frequently be more satisfying than a movie that tries to invoke only one kind of emotional response for its entire running time. That said, there are certain things that, by their very nature, undercut the fun of an escapist action comedy, and depiction of war crimes is one of them. It's hard to see images of mass executions/graves and a man's wife and child gunned down in front of him and then quickly transition into having a goofy laugh at the silly antics of our leads. To put it another way, you're either making Beverly Hill Cop II or Schindler's List, not both at the same time. Not that this is the only problem with The Hitman's Bodyguard. If the goofy antics were leading to consistent laughs, we'd have far more incentive to get past this jarring juxtaposition. 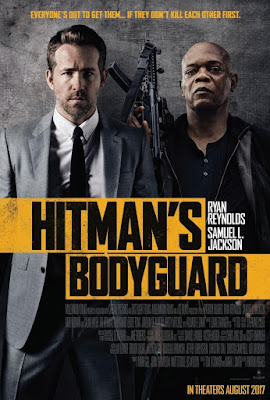 But despite two talented and funny leads and a serviceable (if hardly original) story, this Ryan Reynolds/Samuel L. Jackson vehicle only rarely even comes close to finding its groove. The moments when it does are pretty fun, but not enough justify sitting through the much longer stretches when it doesn't. Michael Bryce (Reynolds), a formerly highly rated special protection agent, is an a major slump. The high profile client he was hired to protect is killed on his watch, and the resulting anger and downward spiral ended his relationship with Ameila Roussel (Élodie Yung of Netflix's Daredevil), a beautiful Interpol Agent. But when Amelia is assigned to get Darius Kincaid Jjackson) an international assassin to teh Hague safely so he can testify against a ruthless European dictator (Gary Oldman), her mission becomes compromised, and the only person she can trust to protect and transport Kincaid is her old flame. Bryce and Kincaid are like Felix Unger and Oscar Madison, but with guns, and their distaste for each other is matched only by their distrust, and their journey from point is fraught not only with peril, but endless bickering. be one of The Avengers. This plot may not sound like it has the makings of a genuine classic, but with the pairing of the two leads, it does sound like a hard movie to screw up too badly. The potential for something in the vein of the Lethal Weapon series is definitely there, and let's face it, only the first one of those had a great script. the rest of them coasted on the strong chemistry between the two stars and the deft hand of a great action director, along with mediocre writing. 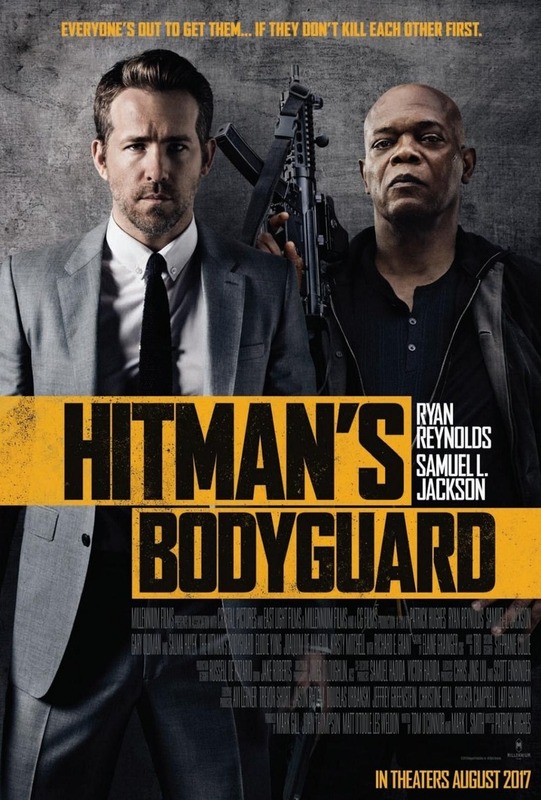 But sadly, the script for The Hitman's Bodyguard doesn't even approach Lethal Weapon 4 in terms of quality. The dialogue is abysmally bad, relying on on using the same profanities and scatological references again and again in place of actual humor. That's not to say that a movie like this is inherently ruined by profanity - let's face it, if you like this kind of action movie, you have a pretty high tolerance - but it has to be cleverly or at least effectively used in the punchline, it can't by the punchline in and of itself, and certainly not repeatedly. We are are long past the point where Jackson using the word "motherf***er" can be particularly funny, because there is no surprise or even shock value to it. There is so much here that is extremely juvenile, and not in an "I shouldn't be laughing at this, but I am" kind of way, but just "I am not laughing." The only thing that works here in Reynolds and Jackson, who click well enough to make you wish they were paired in something better. and once or twice manage to rise above the material. Reynolds is still new enough to being a genuine A-list star that he is really trying to make the most of this, and while Jackson is not, he seems to be having fun and that helps. But the rest of the cast ranging from extremely obnoxious (Salma Hayek, an actress who is almost always watchable but here she's stuck playing a loud, crass caricature) to too serious for the film (Oldman gives the kind of committed, serious villain performance we've come to expect as the dictator from Belarus, but the performance and the moments that are meant to make us hate him clash badly with the rest of what we're watching.). The musical score tracks feel like they've largely been chosen at random, and cinematographer Jules O'Loughlin makes some choices with lenses and filter that are frankly just puzzling. All of this comes back, of course, to the director, Patrick Hughes, who still has to point to The Expendables 3 as his best film (he did a much better job with the action in that film. There is literally only one memorable fights sequence here, a brawl between Reynolds and a Russian thug, and that's really only because the two really throw themselves into it. Reynolds can really sell a Bourne/Bond fight style fight, as we saw in Safe House.). There was plenty of potential here for something really fun and (if not exactly original) different from the rest of the summer fare we've seen this year, and it should have been an easy slam dunk. As it stands, the only thing noteworthy about The Hitman's Bodyguard is the fact that it is one of the most egregious examples of Hollywood's "goof enough" mentality in a summer that has been brimming over with them, and the only thing it will be remembered for is its gimmicky ad campaign.